Very often I hear people ask the question on the strength and weakness of an ERP system. (a YES & NO Checkbox - and we are better!) This is the wrong or improper question in my opinion. One should not be looking for the strengths and weaknesses in the software. 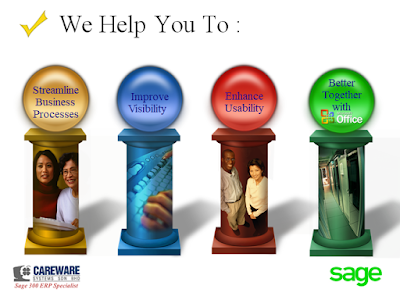 Instead, you should analyse how well the software fits your business needs. Your company cannot exploit the software strengths if they are not in an area you need to use. As an example, there are strong project functionalities in Sage 300 but that probably will not help you if you are a company that manufactures & distributes tea or shampoo. A weakness in ERP might be its use of inventory attributes, which may not affect you, if you manufacture bicycle. So what value does such an exercise provide? Most probably none! There are few proven paths to finding a software fit. There is one "known" way to find software that fits your business and that is to have the sales team demonstrate your processes in their software. And, I would not suggest using all of your processes, just the most important of those. So, how do you learn your important processes? * Top Management Commitment / Lower Management Co-operation. * Involvement of the Account dept, Production dept and sales/distribution dept. * Co-operation of every dept to product accurate and reliable Inventory data. * Don’t look for the perfect software. * Select software that fits those most important parts of the business. * Realistic goals of the Software. SO DON'T GET CAUGHT WITH THE BIG BOYS GAME, (with - EXPENSIVE-REGRETS-PAINS) CHECK OUT WHAT THE ALTERNATIVE HAS TO OFFER. Talk to us, we want to help you simplify and computerize your organization. INDUSTRY 4.0 - Reality and Hype.